In a stunning upset over Republican Roy Moore, Democrat Doug Jones is the projected winner in Tuesday's Alabama Senate race, according to an NBC News projection. Here's how the big night unfolded. Congratulations to @GDouglasJones for his great victory. Congratulations to the people of Alabama for doing what few thought they would do. This is a victory not just for Jones and Democrats. It is a victory for justice and decency. Doug Jones will be an outstanding Senator who will represent Alabama well. 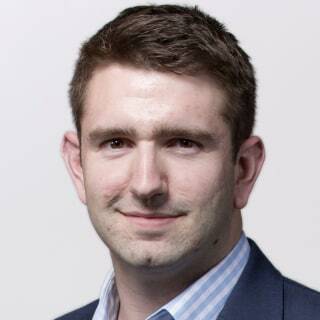 He was a great candidate and will be an even better Senator. The Republican finger-pointing began just moments after it appeared Democrat Doug Jones had defeated Republican Roy Moore. “Not only did Steve Bannon cost us a critical Senate seat in one of the most Republican states in the country, but he also dragged the President of the United States into his fiasco,” the Mitch McConnell-aligned Senate Leadership Fund said in a statement. Bannon, President Donald Trump’s former chief strategist, railed against McConnell and establishment Republicans while helping push Moore’s controversial candidacy. Trump had endorsed Moore’s Republican primary opponent, Sen. Luther Strange, but supported Moore ahead of Tuesday’s general election despite multiple allegations against Moore of sexual misconduct. Doug Jones is the apparent winner in the Alabama Senate race, according to the NBC News Decision Desk, beating out Republican Roy Moore in a stunning upset. 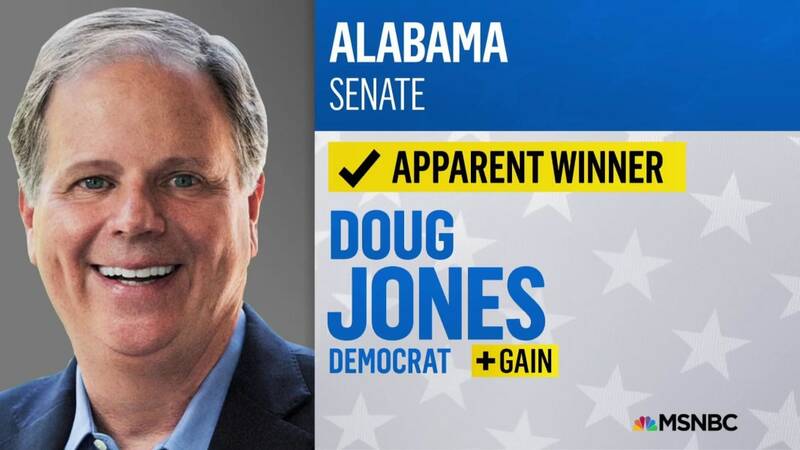 He is the first Democrat to win a Senate seat in deep-red Alabama in decades, pulling out a stunning but slim victory in a race most believed was decided by the Republican primary six weeks ago. Jones was catapulted into a surprisingly competitive race after Moore was accused of sexual misconduct by nine women. He campaigned heavily in the final weeks of the election — particularly appealing to black voters whose historic turnout helped boost his campaign to a win — while Moore shunned the spotlight in an attempt to weather the accusations. Doug Jones is leading in bellwether Talladega County, NBC News reported Tuesday. 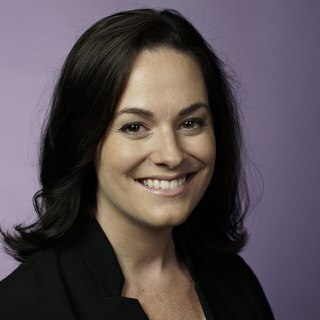 Jones leads there by two points. As of Tuesday evening at 9:57 p.m., NBC News was still characterizing the overall statewide race as too close to call. The midsize county has racial demographics that are fairly representative of the state as a whole — about two-thirds of the county's residents are white — and it's historically been a good predicator of how the state will vote. In the 2016 presidential election, as NBC News' Jonathan Allen reported earlier today, Trump won 62 percent statewide and 61.7 percent in Talladega. Similarly, when Moore won the primary runoff against Sen. Luther Strange in September, he took 52.7 percent of the county's Republican votes, compared to the 54.6 percent he won across Alabama. 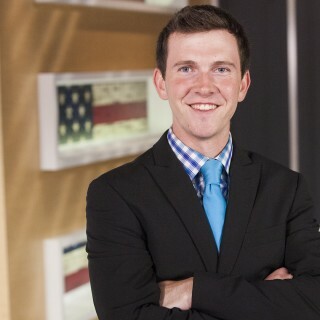 How will Jones do in Alabama's most densely populated areas? One of the big remaining questions in this race — which is still too close to call, according to NBC News' Decision Desk — is how Doug Jones will perform in Alabama’s most densely populated areas, including Mobile and Montgomery (where very little of the vote has been counted yet) and Jefferson — the state’s largest county and home to the city of Birmingham. Jefferson County, like many other large counties in America, has been growing more and more Democratic. It voted for Republicans in presidential contests as recently as 2004 but has become a pretty solid liberal bastion even as the rest of the state has become dramatically redder. 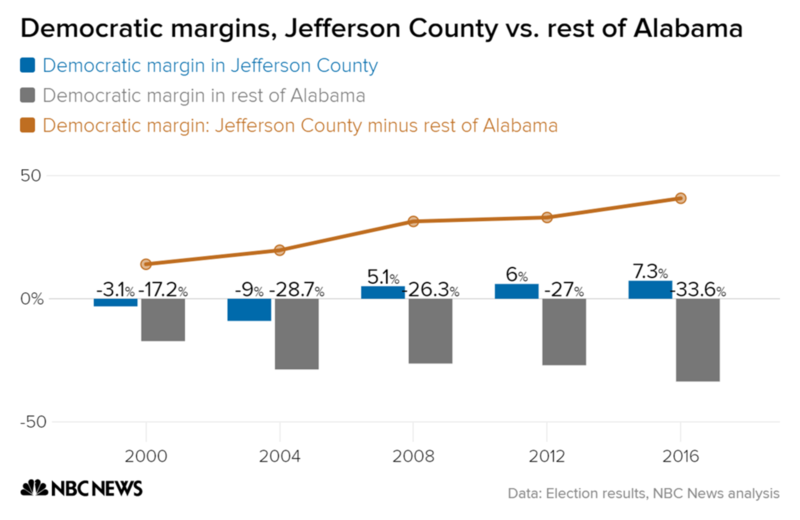 In fact, the divergence between Jefferson and the rest of Alabama since 2000 is one of the most dramatic trend lines of any state in the country, according to an analysis by NBC News last month. We won’t know how significant Jones’ margins are in those large urban counties until we see more votes, but it’s fair to say that this election is likely to underscore the growing divide between urban and rural areas around the United States. 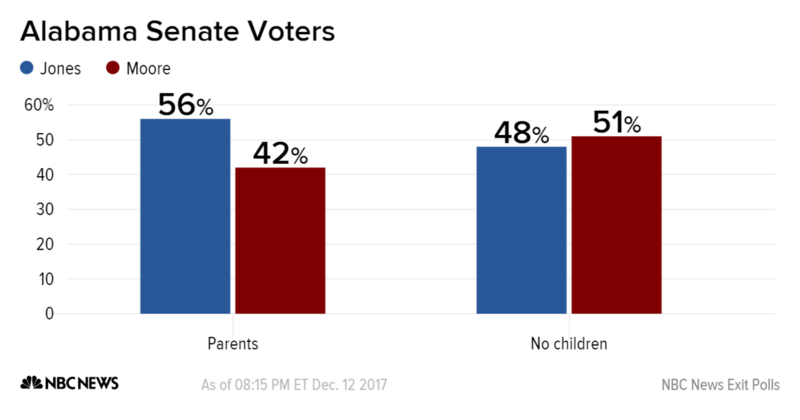 Voters with kids under 18 still living at home favor Democrat Doug Jones by a 14-point margin, while those without children favor Moore by 3 points, according to NBC News exit poll results. This preference is evident in other attitudes as well — especially related to sexual misconduct allegations levied against Moore in the weeks prior to the election. 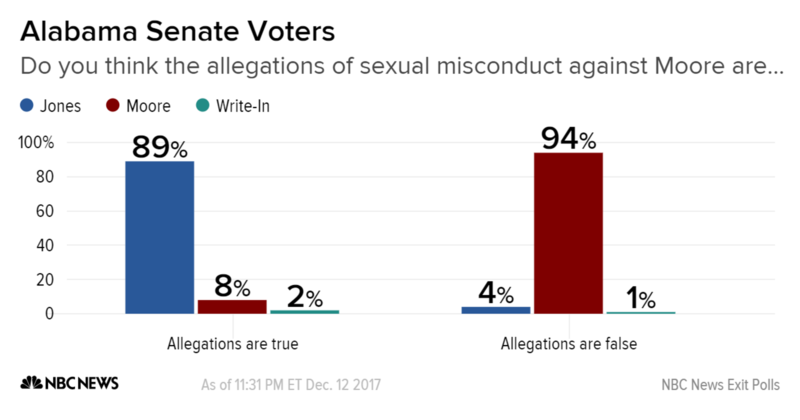 Parents are more likely to say they think the allegations against Moore are true. Voters without children are more split. 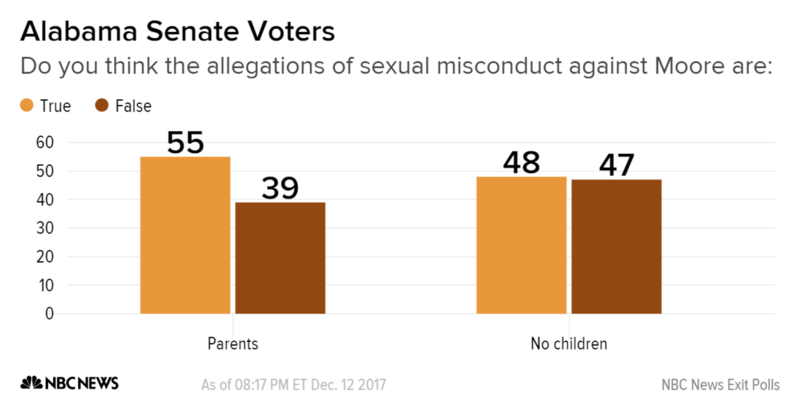 Meanwhile, moms are also more likely than dads to say they think the allegations against Roy Moore are true.